Welcome to the Midweek Makers party, the place to show of your creations! 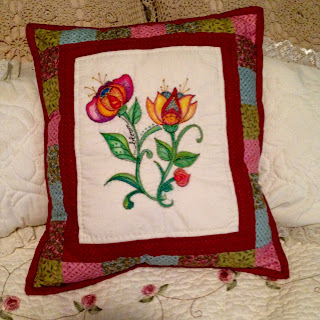 Everyone has been creating really beautiful pieces, and I hope you got a chance to see the lovely pillow Kate, at Yellow Cat Quilt Designs, made from one of her doodle drawings. The flowers are made with acrylic paint and embroidery stitches, and set off with a scrappy border. Well done Kate! Be sure to grab a 'Featured' button. This week, I'm hoping to finish up the baby quilts from two weeks ago. Painting is on hold for now, as we still have the living room to go, but still moving furniture and cleaning. 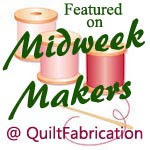 Hoping to grab time here and there to quilt! Thank you for featuring my pillow today!